Samsung will be under the spotlight at CES with its home automation products, smart devices as well as new smartphone-related developments. And it looks like the company is also about to make a big play on innovative devices to help solve real-world problems for the differently-abled. The company announced that it will showcase three new projects at the upcoming CES 2018, developed by its C-Lab (Creative Lab) program, an in-house incubator platform dedicated to the development of innovative consumer products. 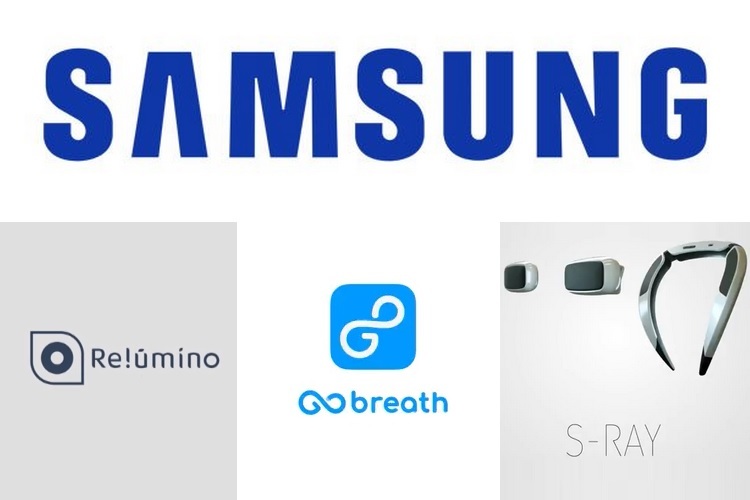 The trio of projects which Samsung is going to exhibit at the upcoming event are the S-Ray (Sound-Ray) directional speaker, GoBreath health recovery solution and the Relumino visual aids. S-Ray or Sound-Ray is a portable directional speaker which is small enough to be portable, without sacrificing on the sound quality and isolation that users expect from a conventional directional speaker. The S-Ray can prove to be an excellent substitute for earphones because unlike them, Samsung’s offering won’t cut the users off from their surroundings, neither will users sufer from ear fatigue after using them for a long duration. At CES 2018, Samsung will showcase three models of the S-Ray directional speaker viz. Neckband, Handy, and a Mini variant. A remedial device which has been developed for folks who are recovering from lung damage, especially those who suffer from postoperative pulmonary complications after general anesthesia. GoBreath is a portable device which works in tandem with a companion app to guide patients through breathing exercises in order to alleviate their pulmonary issues and help them recover. GoBreath provides users swift lung recovery status and can also be connected to a web and cloud service which allows doctors to monitor their patient’s health and dole out necessary guidelines. First created in the form of a visual aid app, Relumino has now evolved into an assistive smart device for people suffering from visual impairment. Essentially it’s a pair of glasses that use cameras and processing power of a paired smartphone to display images with visual and colour adjustments as per the user’s comfort. The team behind the smart visual aid is already working on a new model of the Relumino glasses which is shaped in the form of normal eyeglasses, and we will find out more about this at CES 2018.